The higher educational level of foreign immigrants in Lapland is low, but there are many chances for higher education offered by the Lapland University of Applied Sciences and the University of Lapland. Promoting educational equality and equal access to employment requires lowering the threshold to learning and participation. The key factor contributing to the integration of immigrant students into Finnish society is integration into the educational community. This can be promoted by developing forms of guidance. Multicultural guidance can consciously increase multicultural thinking and take into account the different language and cultural background students in the institution’s practices. The aim here is to ensure that guidance and teaching arrangements take a sufficient account of the special needs of different language and cultural background students. The higher education for immigrants – a path to a degree project (1.1.2015-31.12.2017) – started because of the need to develop education for immigrant students and counselling support services in higher education institutions in Lapland. The University of Lapland and Lapland University of Applied Sciences cooperate to respond to this challenge by preparing a project to develop educational learning paths and information, guidance and counselling services for immigrants. The aim of the project is to improve the level of knowledge, expertise and education of immigrants living in Lapland through Open University studies, and thereby to encourage students to seek a degree as well as to improve their employment possibilities. The aim of the project is also to create, pilot and report a model of information, guidance and counselling service practices at Open University as well as to develop the working life collaboration taking place during Open University studies. In the long run, the project facilitates immigrants’ integration into Lapland and advances Lapland’s business life by enabling immigrants to get jobs or to start and run businesses. Furthermore, it decreases immigrants’ alienation from society. The target group of the project are immigrants living in Lapland who have a sufficient level of language and ability to study in higher education. The project started with the design of educational paths as well as by marketing the opportunity to study in the project and making student recruiting. A total of 18 students were selected for the pilot group of the project; 10 to study at Lapland University of Applied Sciences and 8 at Lapland University. Before the actual Open University studies, in cooperation with the pilot group, the project designed an orientation period to higher education that included grouping, learning skills and preparatory studies. An individual learning path and personal study plan were planned for each student. During the project, the pilot group studied Open University studies at Lapland University and Lapland University of Applied Sciences, each in their chosen educational field. To ensure the smooth progress of studies, the project ensured that the students had sufficient guidance and support services. During the project, various forms of working life cooperation were also implemented, whereby the students of the pilot group built working life networks and contacts, and gained access to different organizations in the form of job visits. The project has collected a lot of feedback, and experience has been gained during the piloting. 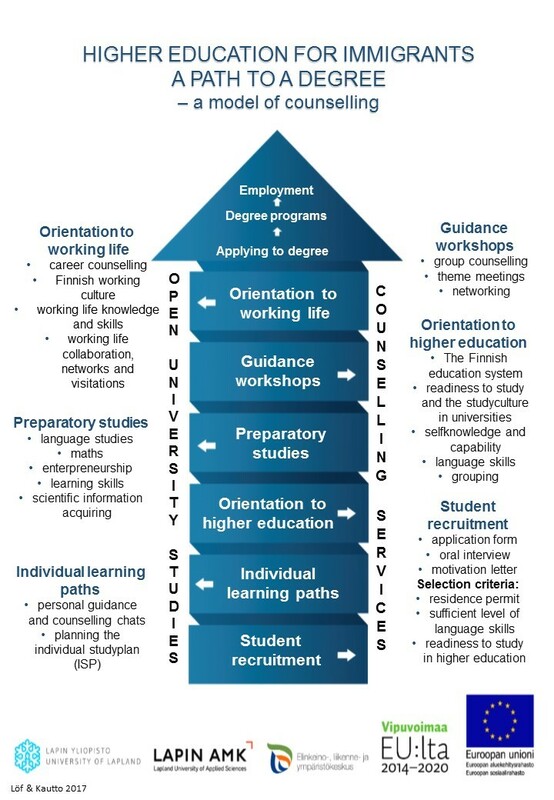 As a result of the project, a counselling model described by the immigrants’ perspective has been drawn up, summarizing the key project-time measures and the counselling service practices in Open University that have been found useful during the project. During the project, a huge number of credits in Open Universities and much more acquired expertise, motivated degree students and future experts of working life have been accomplished. Based on the experience gained from the project, the development of guidance and counselling services in higher education is also important from an immigrant perspective. Multiculturalism brings diversity to teaching and guidance, but the challenges of multiculturalism should also be taken into account when organizing information, counselling and guidance services.